But this baby is all mine! It also takes a loooong time and a lot of wool just to get a small lap rug, which is more or less how big this is at the moment. I want to make this into a large blanket, but I think it will take me well into the new year. I'm using really cheap wool, so the quality's not all that good, but it's ok for me (actually, it's for Sis, but it stays in the family!). I am also stitching all the hexagons instead of crocheting them together. 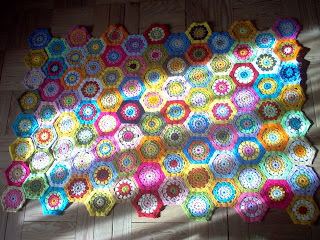 It takes up more time, but it means I don't have to carry around the whole blanket with me and gives me more freedom to move the hexagons around as I like. Oh goodness, that is stunning, gorgeous, gorgeous colours.